Mothers and breastfed babies are needed for posters and brochures promoting breastfeeding in the City of Greater Dandenong. Our next professional photo session will be held on Tuesday April 20th in Noble Park between 9.30am and 12.30pm. All volunteers will receive a CD of photos taken, which can be reproduced for family use. The photographer is female, a mother and works regularly with breastfeeding women and the Australian Breastfeeding Association. The photos will be taken within walking distance of Noble Park station and will include public locations. Women will be photographed individually feeding their baby as well as in groups chatting and playing. All photos will be discrete. 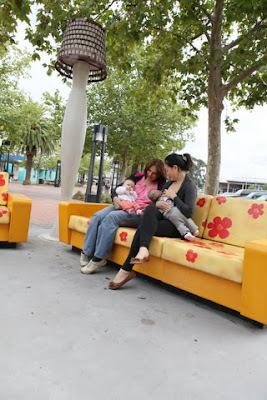 We wish to educate the community about breastfeeding in public and the need to support breastfeeding mothers.